A monastery existed on St Michael's Mount in the 8th century and in 1042 it became a Benedictine alien priory. In the mid 11th century, it was granted to the French, Mont Saint-Michel, which was an independent Benedictine order. Seized and fortified by Henry de la Pomeray in 1193-4, the Mount was besieged, taken and restored to the monks, by Hubert Walter. In 1337, it was once again seized and fortified by King Edward III and by 1425 it had become a garrisoned fortress. During the War of the Roses, the Lancastrian Earl of Oxford captures the castle and was then besieged for six months in 1472-3. Given to Humphry Arundell at the Dissolution, there was a strong garrison of Royalists present during the Civil War, until it was taken by siege in 1646. Purchased by John St Aubyn in 1659, the construction of a private mansion, absorbed most of the remaining fortified structures. Sadly the only remaining fortifications are near the top of the Mount and consist of two lengths of Tudor curtain wall, with large splayed embrasures and a watch tower on the angle. 15 miles north-east is Carn Brea Castle. 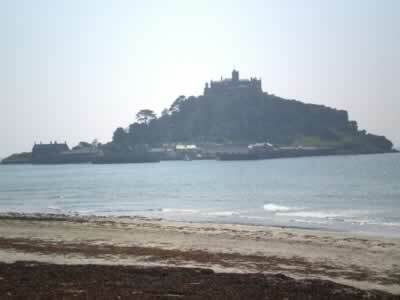 St Michael's Mount is located on an island and is accessed by a causeway or ferry boats at high tide. 21 miles west of Falmouth, on the A39-A394. The site maintained by The National Trust, is the home of the St Aubyn family. Open Sunday to Friday April to June, September and October 10:30-5:00pm, July and August 10:30-5:30. Gardens open mid April to September, winter guided tours on Tuesday and Friday 11:00am and 2:00pm, check website for details. There is a car park on the mainland, adjacent to the island.